1. Before You Begin With the Kids: You will need a block for each child. I chose to cut 10x10" blocks out of cream-colored quilting cotton because I wanted to have a high quality, lasting base for their art work. Cut all the blocks you will need before you craft with the children. Masking Tape: I recommend putting masking tape around all the edges of each block. 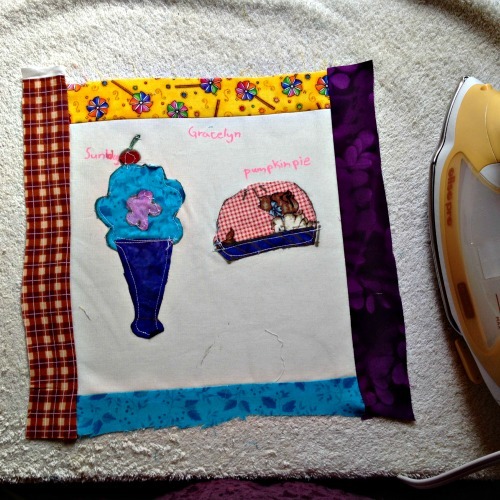 This will help keep the block from fraying as the child works, and also remind the child to keep her artwork inside the frame, which will give you a seam allowance when you sew the quilt together. 2. Set Up a Work Space: Stock a table with various scrap fabrics, enough fabric scissors to keep the project moving (I picked up an 8 pack of fabric scissors at the craft store), and Aleene's Fabric Fusion. Note: If the kids are younger than 8, have an adult monitor the glue usage - many kids don't know how much glue to use. 3. 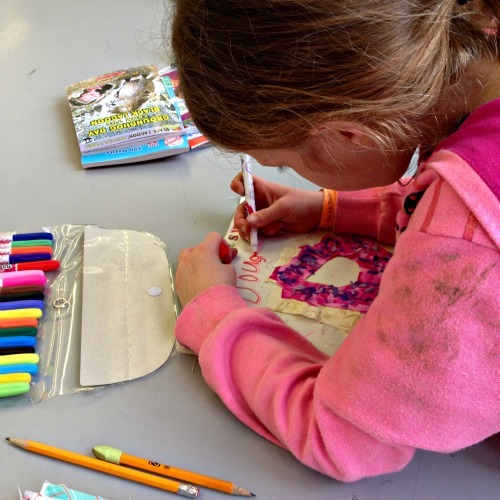 Decide on a Theme: A theme is a nice gift to kids for this project because it gives them a jumping off point for creating their art. Our theme was "Your Favorite Dessert." 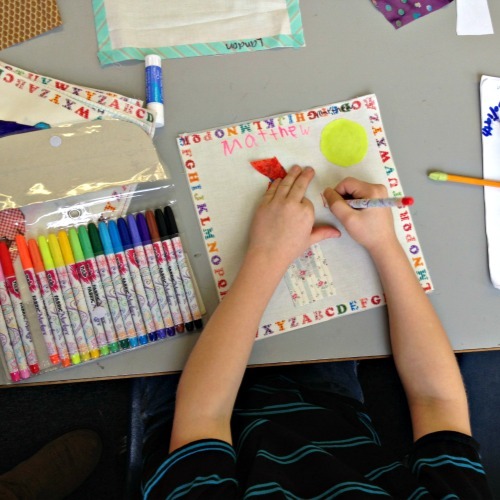 Write each kid's name on the masking tape frame around his block. 4. Let Kids Go! 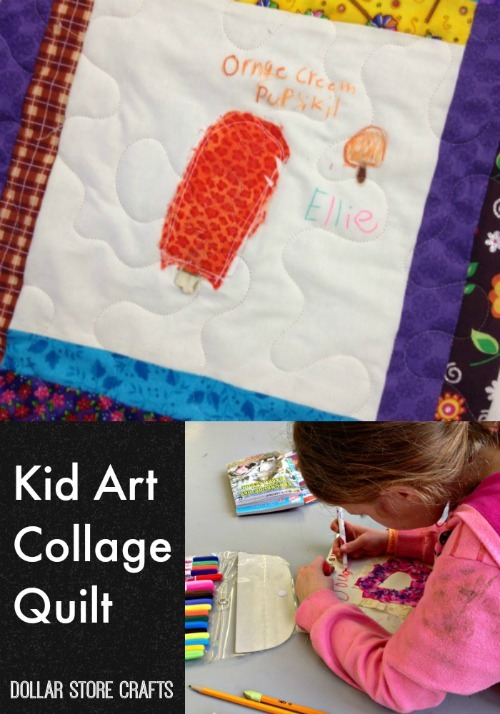 Now is the time to let the kids cut fabric up and glue it onto the square to create their quilt artwork. 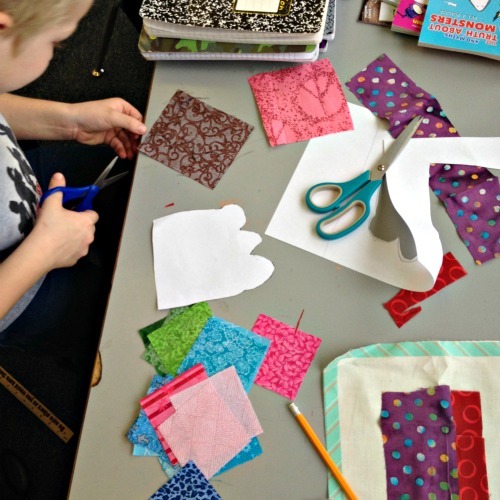 Some kids will need a little direction or encouragement, help with gluing or cutting the fabric. Just be available to help where needed, but don't direct their creative process or do their art for them. When the session is done, let the quilt blocks dry overnight. If desired, schedule another day for collage work, or move on to phase two: Markers! 6. 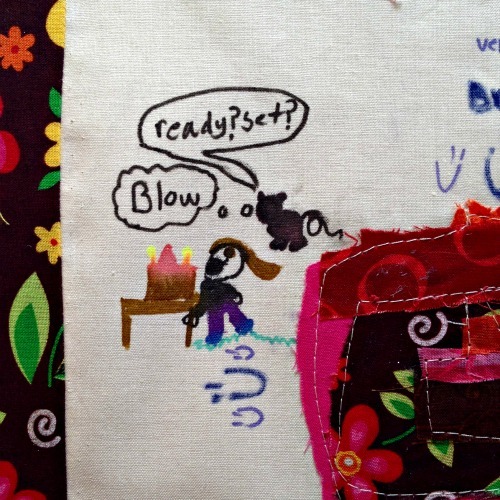 Making Quilt Blocks: At this point, the kids are done with the project. 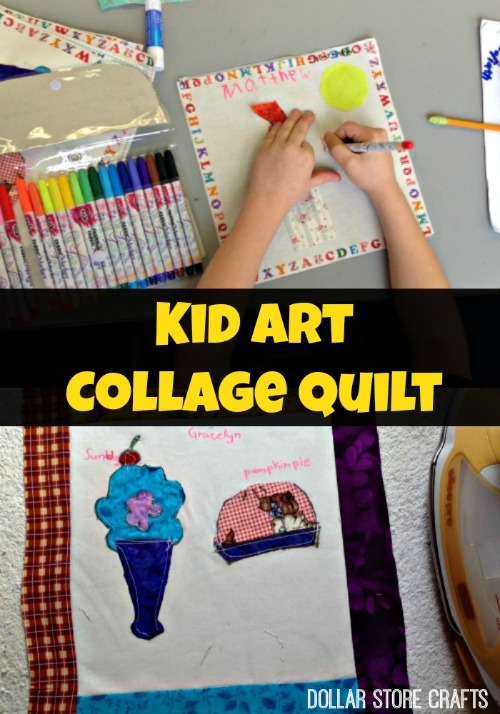 Stitch over their collages with a sewing machine to add extra durability to their collages. Remove masking tape. 7. Assembling the Quilt: There are many ways to assemble a quilt, and I'll leave that design choice to you - you will have to do a little research to figure out how you want your quilt blocks to be put together. What I did: I sewed four different colors of sashing around the blocks to frame them, then I laid the blocks out on the floor to determine the placement I wanted. 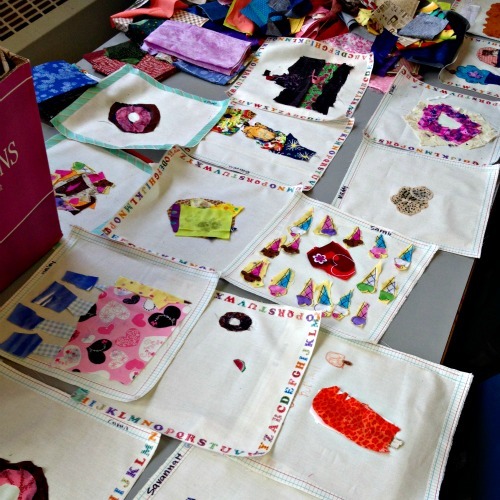 I then sewed the blocks together in rows, then sewed the rows together. 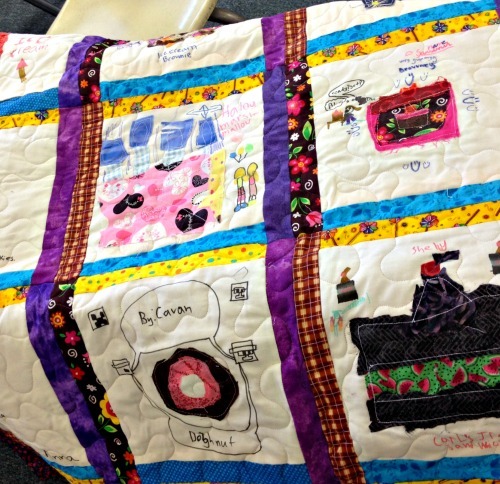 Another parent put the quilt top and backing together and quilted the whole quilt. 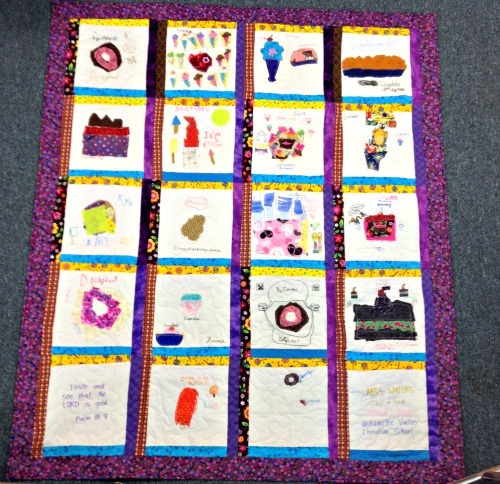 The quilt turned out so darling, and each quilt block is an artistic expression by its creator. 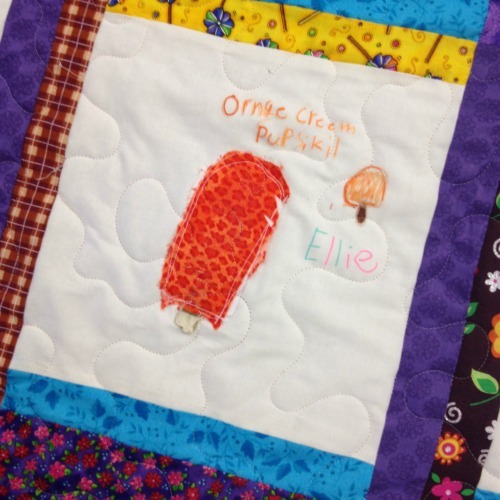 I wrote the teacher's name, the class grade, the school year, and the school's name on one block so we could always remember where the quilt came from. This is a great project for fundraisers like school auctions, keepsake gifts for teachers, or just a fun idea for your child to remember her class by. This is absolutely awesome! My youngest son would love to do this. Thanks so much for sharing. Very cute! I want to do this with my niece!